"I'm Genki of the Air, and I have no quarrel with you unless you try and stop me!" 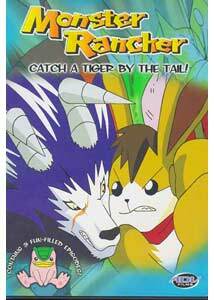 Catch A Tiger By The Tail continues the Monster Rancher saga in which the young boy Genki seeks to find mystery discs scattered around an alternate dimension in hopes of finding the Phoenix inside one of them. Since we're still very early in the series, the story is busy introducing characters, and that's really what this disc is all about. As things start out, Genki and his friends run into an amazingly meanspirited monster trainer called Allan. Rather than respecting his monster (a giant worm), he abuses it, taunts it, and make it perform evil deeds for no discernable reason. To make things worse, as Genki searches for a mystery disc, Moo (the great evil being he wants to stop) has sent some baddies after him. Allan decides to help out the baddies, but his mistreatment of his worm might backfire on him.Eventually, Genki and friends find themselves in a desert region where a rather infamous group of monsters live, having freed themselves from human owners. Although all these creatures look like giant wolves, they're called 'tigers' for some reason. In any case, their leader is the feared 'Tiger of the Wind', a powerful monster who distrusts humans. He eventually learns, though, he'll have to team up with Genki if he wants to see the evil of Moo destroyed. When more of Moo's dinosaur troops come to harass Tiger of the Wind, the choice is made even more clear. Later on, they all find themselves without any money, so they decide to compete in a local monster battle. If they win, they'll have a lot of money to fund their quest, and Tiger volunteers for the job. Unfortunately, he loses to the rather unscrupulous con-artist known as Hare, a giant rabbit with a talent for being extremely dishonest. Eventually, Tiger, Genki, Suezo, Golem, and the rest will have to deal with this character once and for all, or lose their money for good.Like many cartoons based on comics or video games, the early episodes are spent introducing the main characters who are most closely identified with the source material. In this case, now that Tiger and Hare have showed up, all of the 'name' creatures from the game are accounted for, which means the story can go in more developed directions. Although definitely a kids cartoon, Monster Rancher still has some widely enjoyable aspects, mainly that it never slows down. The story is always kept fresh, exciting, and on topic, without getting either amazingly preachy or boring. The writers seem to want most of the episodes to have some sort of moral, but it isn't annoyingly obvious. It's just something to watch while eating popcorn and drinking soda, that kind of thing; for that, it works perfectly. Image Transfer Review: The crisp, clear, and digitally perfect image makes Monster Rancher a very solid disc in terms of quality. The animation is virtually direct-from-cel quality, with no signs of compression issues or source material flaws. While the sharpness causes a little bit of moiré and dot-crawl on some edges, it's a fairly fleeting effect that will probably not be noticed on higher-level displays. Audio Transfer Review: The English, stereo audio is perfectly suited to the show, allowing the action sequences and energetic pace to really come alive, despite no surround effects. As with other BKN shows, the original Japanese dialogue is not present, but the dubbing is actually pretty good in my opinion, allowing for good characterizations of all the creatures, and given the juvenile nature of the show, I'm guessing little (if any) dialogue was altered. Extras Review: There are no additional features on the disc, although the opening and closing credits are separated onto their own track. If I had a complaint, it would be the fact that there are no chapter stops withon the episodes. Monster Rancher, as game/toy/marketing-based cartoons go, is a nice escapist show. Nothing serious or artistically masterful, just some quick fantasy to fill the time perfectly.